Iranians use computers at a cybercafe in the center of the Iranian capital Tehran on May 14, 2013. What would your life look like without the internet? Reliable internet access has become an important part of daily life in much of the world — and President Obama will be pressing on its importance in his State of the Union address on Tuesday evening. Tonight, the buzz might follow Obama's plans for education, immigration, or tackling income inequality, but the seemingly less glamorous issues of net neutrality and access to high speed internet are issues that are part of a worldwide debate. But even though the debate in the US might be focused on internet speeds and private/public control, there are many people in the world that aren't even online. These charts show how many people are online in each nation. 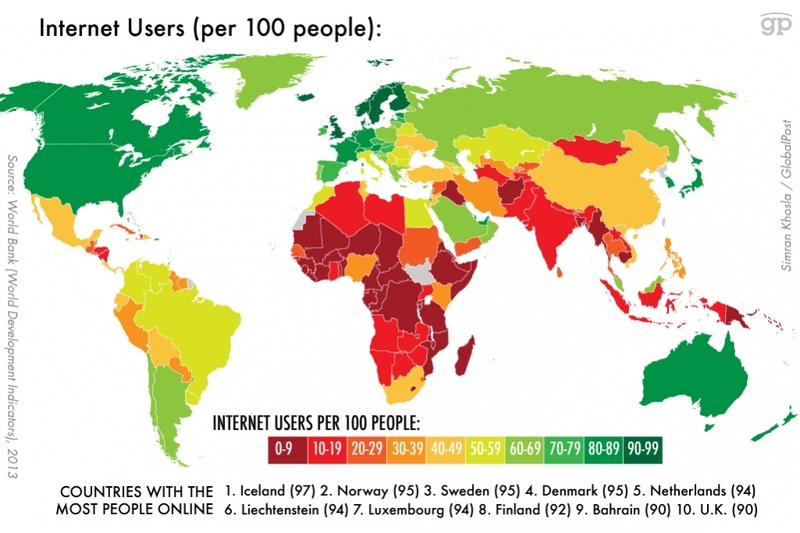 The first map shows how many people are online in each nation, per 100 people. The next chart shows regional averages.